The restoration of Hotel Weyanoke began in December 2016. 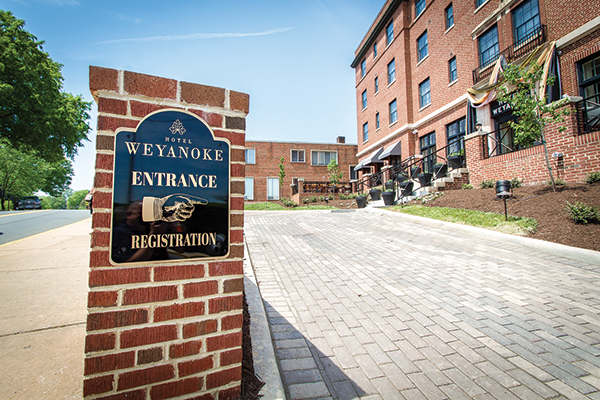 The reopening of the historic Hotel Weyanoke in Farmville marks a first for Richmond-based developers Ross Fickenscher and Garrett Shifflett. While they are specialists in historic renovation, they had never before bought and restored a hotel. “It seemed like a good idea, and we ran with it,” Fickenscher says about the building, which they bought in 2013. Originally opened in 1925, the hotel served a variety of guests over the years, including the author and lecturer Helen Keller. The building was converted into a home for the elderly in the late 1980s and later became a residence hall for Longwood University sororities. The original building now includes 27 hotel rooms and four food and beverage venues. “We added a wing to the back of the building with an additional 43 rooms for a total 70 rooms,” Fickenscher says. The food and beverage operations will include the Sassafras Coffee Bar, Catbird Rooftop Terrace, Effingham’s and Campagna Italian Kitchen and Wine Bar. All of these venues and the hotel will be operated by Williamsburg-based Cornerstone Hospitality.